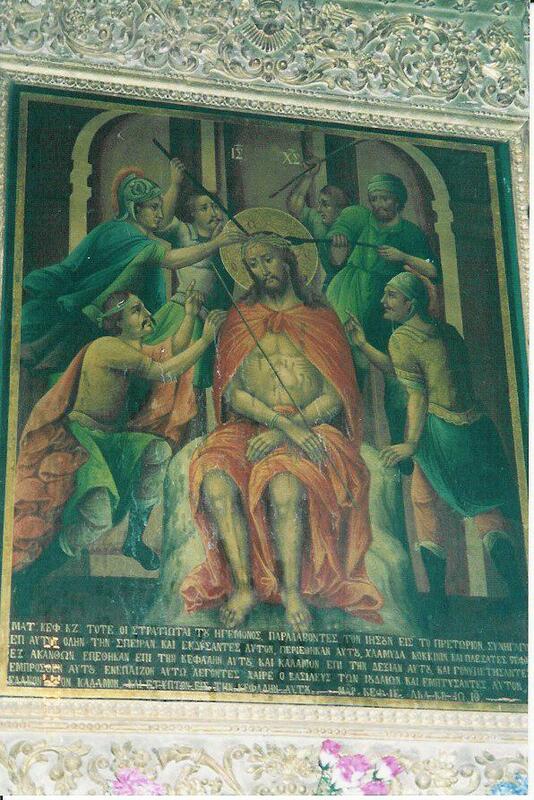 Bleeding of the icon of the Lord Christ in 2001 on the eve of the Holy Fire rite. You may see runs of chrism at bottom from feet of the Savior and from letters under the feet. Below we quote description of this miracle by Mario Peichev (USA, New-York, Russian Orthodox Church Abroad), who the author of photo and the witness of this miracle . This is a photo which I made thanks to LORD GRACE in 2001 on the eve of Great Friday. We - the group of pilgrims from Russian Orthodox Church abroad were in the church of Holy Sepulcher waiting for the Holy Fire descend, we red acathistus and prepared to this GREAT MIRACLE. Suddenly reanimation between people appears at 23 o'clock. Romanians and Greek who sit alongside, started to talk very emotionally about an "IKON". The Greek woman who sit near me said that the Icon of our LORD JESUS CHRIST started to bleed. I went to the Stone of Flagellation and saw many people - monks, pilgrims which stay in front of the icon of the Lord with veneration and God's fear. The chrism bleed from the shank of the Lord, it run down to letters of text under the icon. I made a photo. The editor of site expresses thanks to the Mario Peichev for send photo and description.